We left Neurum Creek after packing up in some passing, but light showers and headed north through some great scenery in the Sunshine Coast Hinterland. The road heading down into Kenilworth was spectacular, climbing, and then following the ridge line, with a deep valley either side. As we got close to Maryborough, the heavens opened as we moved through a fairly decent storm. We were still traveling with my parents, so followed them into Maryborough for lunch. They and the kids found something to eat at a bakery just outside of town, however there was nothing there to satisfy the dietary requirements of Rach and I, so we decided to fill the car, and then head deeper into town, while mum and dad would keep heading towards Bargara. We were still following the storm, and just out of Childers we caught it, and followed it the rest of the way until we were just out of Bargara, where we arrived and had enough time to set up before the rain arrived. 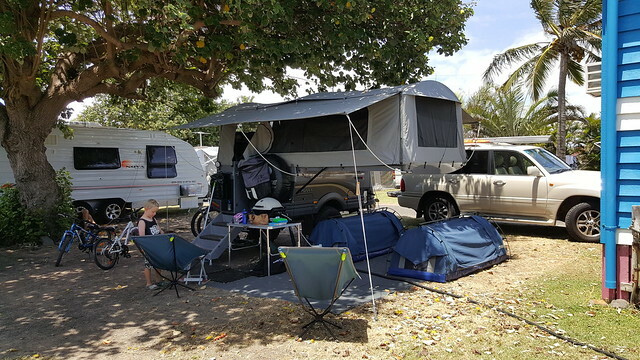 Our small site, next to Mum and Dad in their caravan… but under the tree. 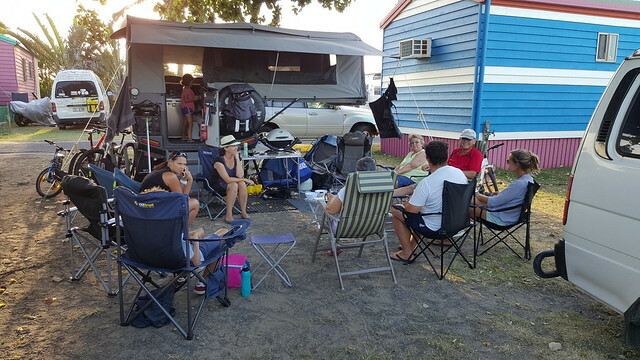 That night we caught up with extended family Dean and Alina and their kids, along with my Aunty and Uncle whom we’d camped with previously at Crescent Head. The kids enjoyed a big swim in the pool with their second cousins whilst the adults caught up over a great BBQ and a few drinks. The Bargara region is known for the large colonies of Turtles (particularly Loggerhead turtles) who nest in the area. We had booked in to see the turtles at Mon Repos which is a couple of minutes north of Bargara. 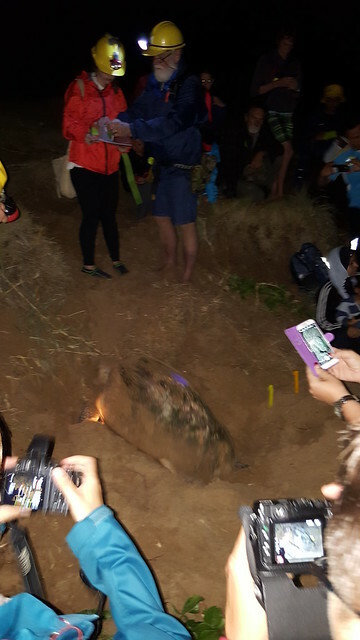 The turtles were laying their eggs, and we arrived at about 7pm, to be put into groups that would be taken down to the beach when a turtle had chosen an appropriate nesting place. We were in group 3, and were called at about 9pm and taken to the beach. The kids loved seeing the eggs being laid, and were fascinated with how mum then carefully filled the hole again with sand over the eggs. This process lasted perhaps 40ish minutes before she turned around and returned to the sea. Once laying, the turtles weren’t too bothered by the paparazzi! We were extremely fortunate, as the weather had continued with the wind and rain that followed us in when we arrived, yet held off during our time on the beach. As we returned to the car at the end of the evening, it again bucketed down for our drive home. The following day the girls all went shopping so Lucas and I hung out for the day. 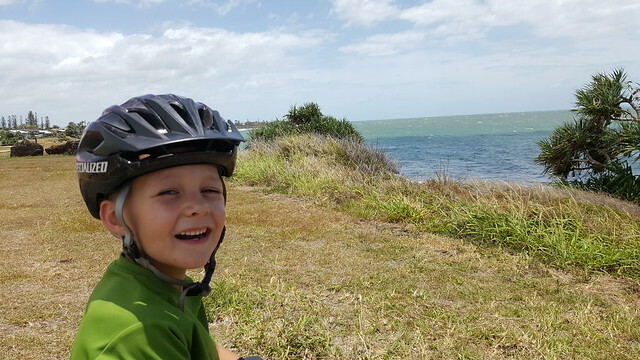 We did a bike ride in the morning, leaving the caravan park and heading north through Mon Repos where we had been the previous evening, and all the way to Burnett Heads. Our trip north had the benefit of a pretty substantial tail wind. At one stage we must have been hammering along at about 30km/h. A couple of times I told Lucas that it was going to be really hard work going home, and asked if he wanted to turn around, but he declined. As soon as we turned around at the end he worked out what it meant to ride into a head wind and worked very hard on the way home! Down to first gear and grinding away. A lesson learned! That said, he did a fantastic job, I gave him a little push along with a hand on the back a couple of times when morale was getting a little low, but 25km later he had sure earned his ice cream! After the ride we planned to visit the Hinkler Aviation Museum, but needed to get some lunch first. 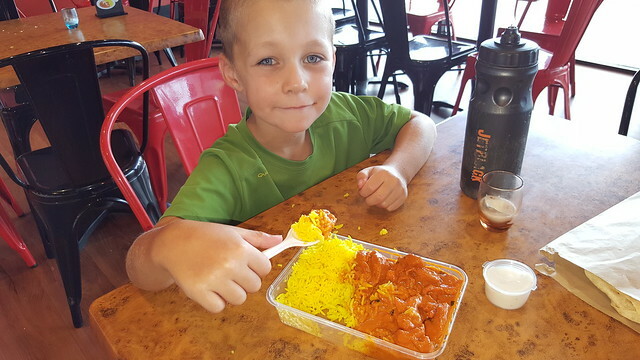 We decided to share a Curry from “Miss India”… suffice to say that’s the last time I agree to SHARE a curry with Lucas! Especially after an epic ride. The Hinkler museum was really interesting, detailing the aviation exploits of Bert Hinkler. I’m not sure whether I missed that at school, but I had no idea about him before visiting and I found it a great little museum. I think the flight simulators were the highlight for Lucas. We topped off our day with a quick visit to Bundy Bikes, the local Specialized dealer to do a bit of bike dreaming! Next time you’re getting your own Dad! As per usual, Lucas spent his birthday away from home. It was a fairly quiet day with visits to a couple of shops to pick up some food and bits and pieces. We had dinner at the Bowling club which was pretty much one debacle after another. 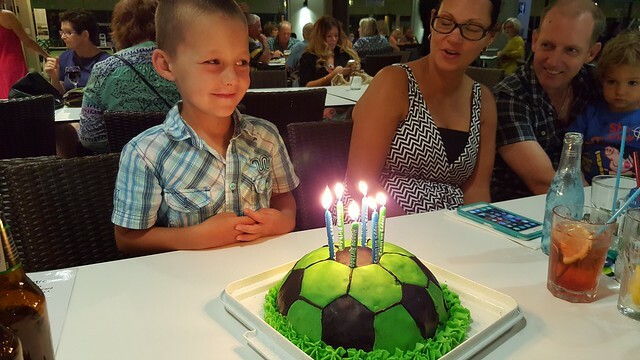 Not to matter though, Lucas thought it was great, and was super impressed with his soccer ball birthday cake that Rach and Alina had made that afternoon. We spent New Year’s Eve at Dean and Alina’s place, where the kids enjoyed a swim and the adults enjoyed a great BBQ before watching the Sydney 9pm fireworks and heading back to bed not long after. New Year’s Day was the nicest day we had enjoyed so far, and we made the most of it by spending some time at the beach at Elliot Head which is a great little spot. The kids have become far more confident in the water and were doing some great swimming, even trying to catch the little waves. Quickly, it seemed, our 6 nights here had come to an end again. It was great to catch up with family, even if we were starting to go a little stir crazy in the tightly confined caravan park. After saying goodbye to Mum and Dad, who were continuing north (hopefully – weather permitting) to Darwin, we set off again in search of some camping that was more our style.